Earlier this year, the Virginia Lawyers Weekly conducted its second annual reader’s ranking poll for various legal related services in Virginia. 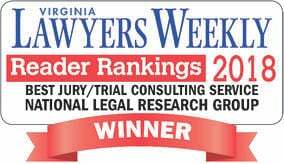 For the second year in a row, the National Legal Research Group, Inc. (through its Jury Research Services Division), was ranked number one in the category of “Best Jury/Trial Consulting Service” in Virginia. 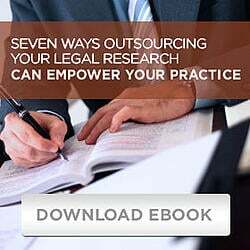 This is an acknowledgment of our hard work and dedication to providing quality jury research services to attorneys both in Virginia and across the nation. We thank the readers for their recognition and support. This book is packed with updated practical advice, a new chapter on courts-martial, and supplemented with appendices, including examples of useful voir dire questions for civil and criminal cases. In addition, you will have access to an Internet catalog of more than 190 juror questionnaires, including questionnaires from Colorado v. James Eagan Holmes, In re Exxon Valdez, i4i LP v. Microsoft Corporation, David Mueller v. Taylor Swift et al., United States v. Zacarious Moussaoui, California v. Scott Peterson, United States v. MAJ Nidal Hasan, and United States v. Senator Robert Menendez and Salomon Melgen, among many others. We will be covering additional tips from our Master Group Voir Dire Tips Series in the months to come. Check out previous information from the tip series with our introductory two-minute video, Tip 1, Tip 2, Tip 3, Tip 4, Tip 5, Tip 6, and the video for Tip 7.